Update 4/6/17: Sadly, this information is out of date, because the last time I tried to recycle batteries at Lowe's, they only wanted tool batteries or rechargeable tool batteries used in power tools, and no household batteries. I called the Maui County Recycling Office and they referred me to Community Work Day, aka Malama Maui Nui (MMN), a nonprofit involved with many recycling programs. According to MMN, the household battery recycling program ended June 2016 and has not received more funding. 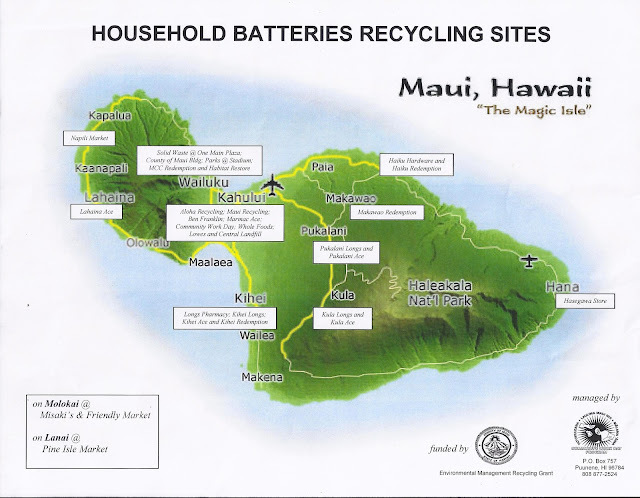 Used batteries leach toxic chemicals in landfills, so instead of throwing them in the garbage, take them to a battery recycling site on Maui. Here's a photo to help you know where to take them. I usually collect a bunch of used batteries to take at one time. The photo is a bit hard to read, but it's a high quality scan of a handout from Community Work Day, so it's also easy to save and print. 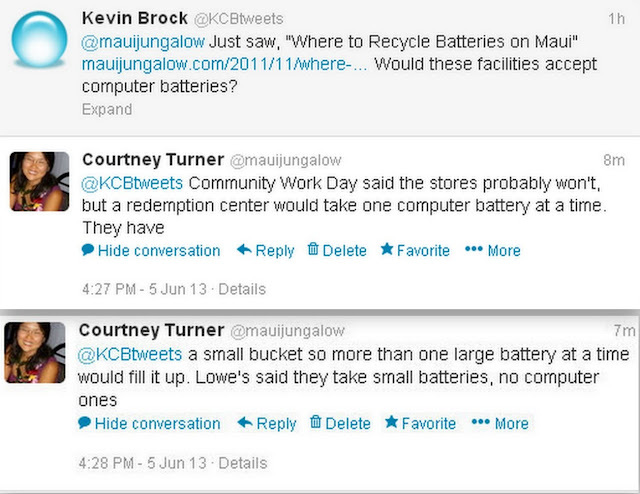 Mahalo for the question, @KCBtweets. The gal at the other end of the line said she didn't think any of the stores would take computer batteries because they are so big, but said if it was just one or two, that the Redemption (aka County Recycling) Centers would take one or two. They only have a small bucket, so they are not equipped to take a lot of them. There are redemption centers run both by Aloha Recycling and Maui Recycling. Both of them should be able to take the larger batteries. Lowe's also confirmed that they only take small household batteries, and do not take computer batteries. Reading this list, I am wondering if Lanai or Molokai have recycling centers aka redemption centers. Found out, yes they do, but they do more metal and aluminum recycling. They probably don't take computer batteries there. What about lots of computer batteries? Community Work Day said you can take them directly to their office in Pu'unene (pick up and drop off used paint while you're there, and visit the inexpensive Friends of the Library bookstore) or take them to Habitat for Humanity's E-Cycling on Tuesday or Saturdays. For old phone books, Francine said the phone book recycling drive is over (as of 5/17), but she recommended the drop off bin at Royal Hawaiian Movers. To recycle other things on Maui, visit the Maui County Recycling page.